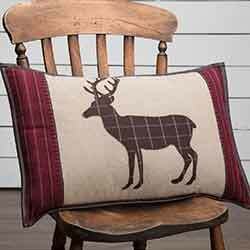 Lodge & Cabin Decorative Accent Pillows, in rustic, cabin, hunting, fishing, lodge, man cave, or lake themes, featuring icons such as moose, deer, bear, pine cones, and more! Bring the warmth of log cabin charm into your bedroom with the Cumberland Collection! 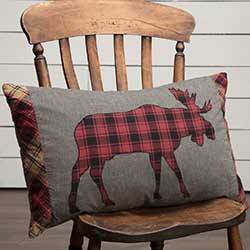 Complete the look of your bed with the Cumberland Moose Pillow. Bring the warmth of log cabin charm into your bedroom with the Cumberland Collection! 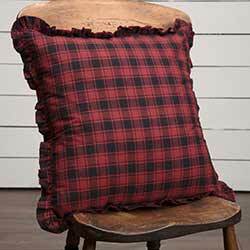 Complete the look of your bed with the Cumberland Plaid Pillow. Bring the warmth of log cabin charm into your bedroom with the Cumberland Collection! Complete the look of your bed with the Cumberland Quilted Pillow. 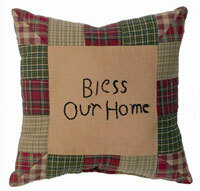 Tea Cabin Bless Our Home Decorative Pillow, by VHC Brands. 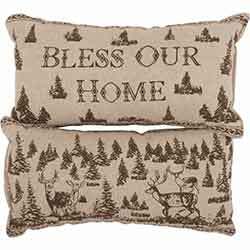 Add a decorative touch to your country home decor with this accent pillow, with stitching in the front proclaiming "Bless Our Home." 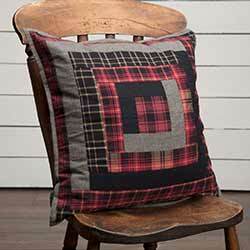 Patchwork border features homespun plaids in forest-like greens, navy blue, and barn red. 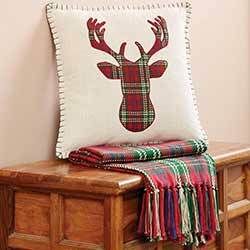 Trophy Head Decorative Pillow, by VHC Brands. Truly a showpiece, this decorative pillow features a coffee brown faux leather trophy head for the perfect decor accent for your livingroom, bedroom, or entryway bench. The Woodland Christmas Pillow set captures the beauty of the outdoors, with stenciling reminiscent of Nordic ironwork and woodcarvings. 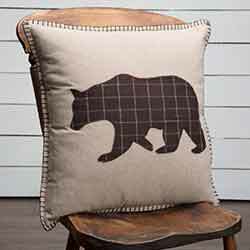 The generously sized 18 inch Wyatt Bear Applique Throw Pillow looks great on a bed, the ends of a sofa, or anywhere you desire a rustic lodge look. 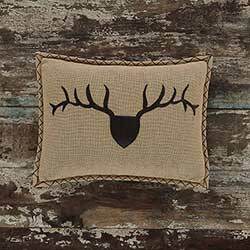 The Wyatt Deer Applique Throw Pillow is proudly displays rustic roots with its textured khaki chambray base with a centered espresso and white windowpane appliqued deer. 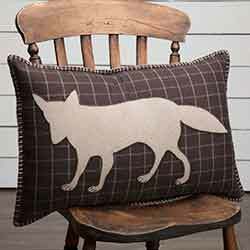 Make a statement with the fun Wyatt Fox Applique Throw Pillow, featuring espresso brown and white windowpane plaid with an appliqued fox motif in a textured khaki chambray.